The Italian Riviera, stretching between the sea and high mountains, is the ideal landscape to bike with a stunning sea view. And it is precisely in Levanto that, on a hot mid-July morning in, I biked on one of the most scenic routes I’ve ever done on a mountain bike in the last few years. A 30 kilometer long route with about 650 meters of medium difficulty level; very interesting for the views, but not only: you have the opportunity to visit the typical Ligurian villages perched on the sides of the mountain, to immerse themselves in the characteristic Mediterranean vegetation, to admire the jagged coast that plunge into the sea meeting all the tones of blue and finally, but not least, to go through the very unique bike path that connects Framura to Levanto. 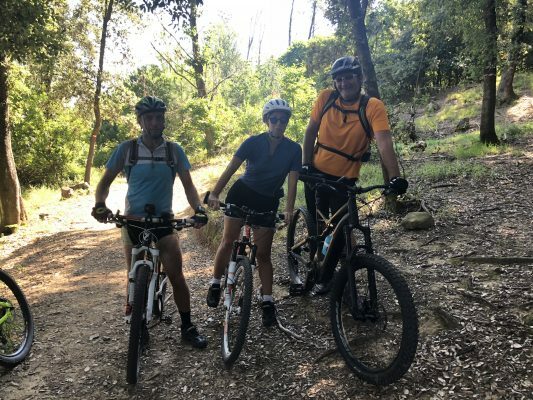 We started from the center of the town to get on a bike through the SS332 provincial road that leads to the Bracco pass, a classic if you want to explore the Levanto valley by MTB. The bends climb quickly and we cycle through breathtaking views stretching towards the sea and the small villages of pastel-colored houses that dot the mountains seeming to embrace the indented coastline. The road is not very busy and we reach 650 meters high in less than an hour. We have to leave on the left at the 9th kilometer: the intersection to be taken is easily recognizable because you will find the paths of Liguria hiking sign. The dirt road is at first wide and not very bumpy, but then immediately begins to descend into a single-trek that enters a dense forest. This is the most demanding part of the entire route: steep descents from the stony bottom alternate with rough and little traced sections. We follow the path for a few kilometers until we reach the asphalt that will lead us to the first village that makes up the municipality of Framura: Costa. Framura, they explained to us, is a municipality made up of 6 villages, the marina and six beaches. From the square of Costa we admire the view below us. Unfortunately, the weather is tight and we still have a long way to go: we take the narrow road to the right of the square that goes up to Mount Serro: two difficult steep sections will put a strain on our legs (and our breath). We carry out the entire perimeter of the mountain through a road that will allow us to admire from above even the town of Deiva Marina, located north of Framura. Again woods and single-trek, this time the descents are simpler and even more fun; then take the road that will take us back to the asphalt, but first, by making a small deviation to the right, we can admire one of the most beautiful views of our ride in Levanto in MTB: we are in Punta Apicchi. To the north is clearly the profile of the promontory of Portofino while to the south the blue of the sea lets us glimpse the port of Framura and the wonderful jagged coastline that slides towards Levanto. From the asphalt road we take a Creuza (which in Genoese dialect indicates a suburban road that runs between two walls that determine the boundaries of property) that will descend to the Marina di Framura passing through two other villages: Setta and Anzo. We reach the characteristic port of Framura, load the bikes in the elevator and then take the beautiful bike path that in about 7 kilometers will take us back to Levanto. A post by Fabiola, who also wrote about Levanto on her own blog Fabilax: Levanto, not only sea.